"You've got to always look on the bright side of life. Because any attempt to deduce the bright of life from reason alone will still rely on concepts gained from prior experience of the bright side of liiiiiife." 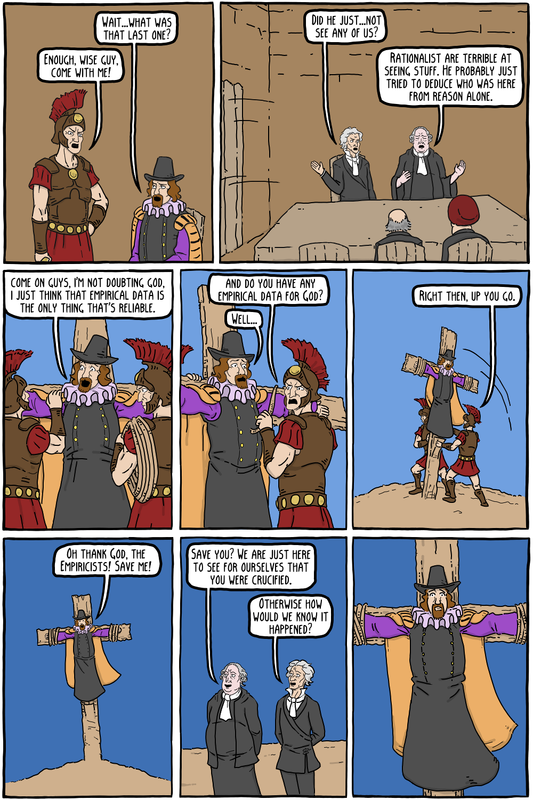 This comic is a parody of Monty Python's "The Life of Brian". René Descartes is one of the greatest philosophers of all time, and in many ways he kicked off "modern philosophy". 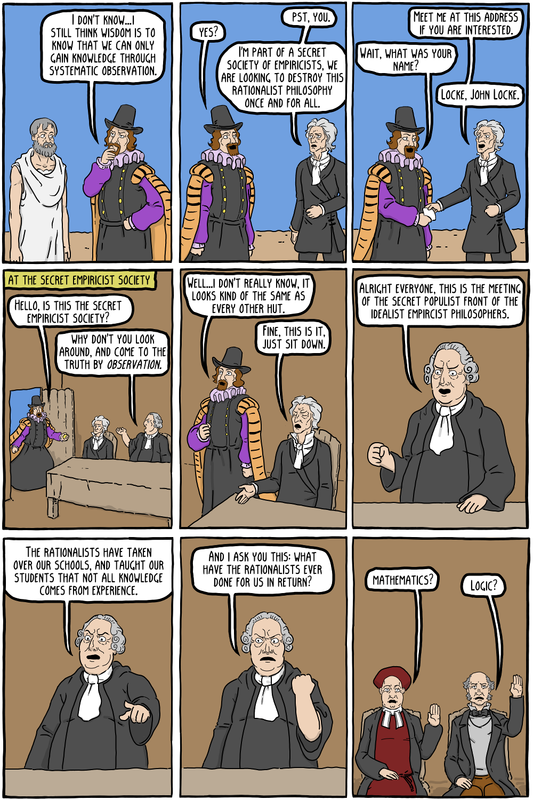 After Descartes, there was a big split in philosophy on the problem of how you acquire knowledge. People like Descartes, Leibniz and Spinoza were rationalists, believing that you gain knowledge primarily, or only, through the powers of reason. People like Hume, Locke, and Berkeley were the empiricists, believing that knowledge comes from our senses. Francis Bacon isn't generally important in the major arguments, but was one of the very early advocates of empiricism, and the "scientific method", just before Descartes came on the scene and the big debate between the two camps really took off. Obviously, this is a crude overview, and each philosopher had their own detailed opinions on how we gain knowledge of the world. 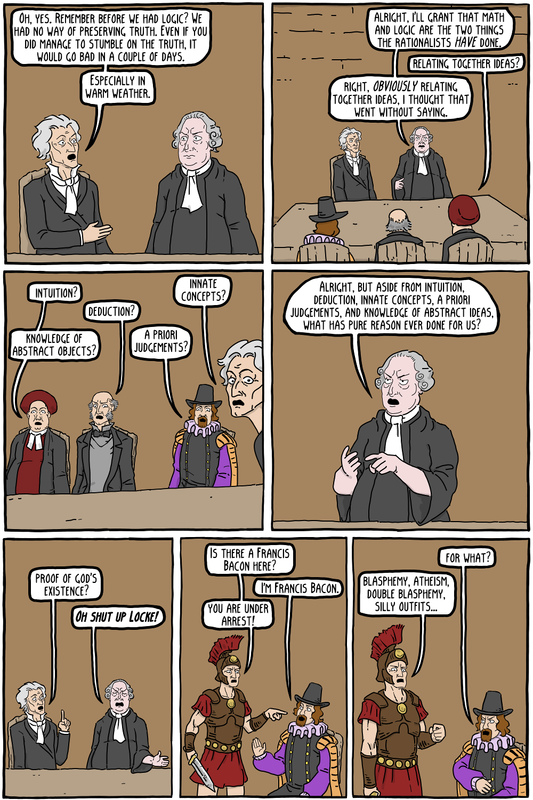 The debate pretty much ended after Immanuel Kant solved philosophy. While many of the Empiricists were accused of Atheism, and some of them, like David Hume, may have actually been Atheists, Francis Bacon wrote against atheism and saw no conflict between Science and Religion. An empirical investigation of Science, for Bacon, was an investigation of God's works. 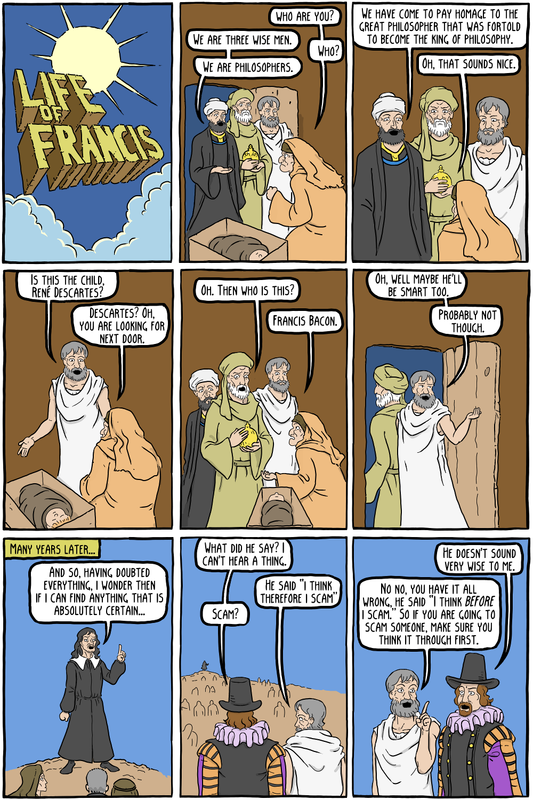 You can read more about it on the Stanford Encyclopedia of Philosophy.